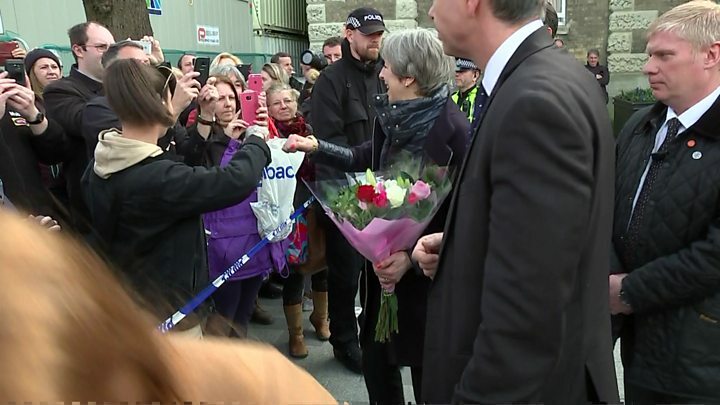 Theresa May has visited Salisbury after the "brazen" nerve agent attack on a Russian ex-spy and his daughter. The prime minister was briefed by public health experts, as the pair remain critically ill in hospital. Mrs May has said Russia is "culpable" for the attack and that she is expelling 23 Russian diplomats - but Moscow denies all involvement. France, Germany, the US and UK said in a joint statement Russian involvement was "the only plausible explanation". Mrs May added: "This happened in the UK, but it could have happened anywhere and we are taking a united stance against it." The countries' leaders condemned "the first offensive use of a nerve agent in Europe since the Second World War". US President Donald Trump told reporters at the White House: "It certainly looks like the Russians were behind it, something that should never ever happen. "We are taking it very seriously as, I think, are many others." Mrs May's expulsion of diplomats has prompted Moscow to say it will expel UK diplomats "soon". Meanwhile, Defence Secretary Gavin Williamson said Russia should "go away and shut up". The Russian Ministry of Defence called Mr Williamson a "vulgar old harpy". Major General Igor Konashenkov said that "the extreme level of the intellectual impotence" of Mr Williamson confirmed London's accusations amounted to nothing. "Long ago, Great Britain became the cosy nest not just for the world's turncoats, but also of all kinds of headquarters for producing fake scandals," he added. 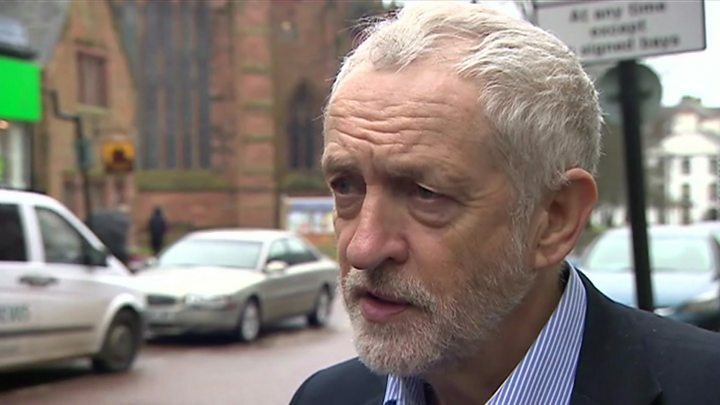 Labour leader Jeremy Corbyn, who has been criticised for not being firmer in his condemnation of Russia, has defended his stance, clarifying that he did think evidence pointed towards Moscow. Media captionJeremy Corbyn: "The source of this weapon, which appears to be Russia... must be brought to justice"
Russian former spy Sergei Skripal, 66, and daughter Yulia Skripal, 33, remain critically ill in hospital 11 days after they were found unconscious on a bench in Salisbury, Wiltshire. They had been poisoned with a nerve agent of a type developed by Russia called Novichok, the UK government has said. A sample is to be sent to the Organisation for the Prohibition of Chemical Weapons - the independent international body set up to stop chemical warfare - for analysis. Russian Foreign Minister Sergei Lavrov reportedly said the allegations against Russia were "absolutely boorish" and said the UK's approach was partly prompted by its Brexit problems. Mrs May thanked emergency services in Salisbury and spoke to members of the public during her visit on Thursday. She also visited Det Sgt Nick Bailey in Salisbury District Hospital, where he is being treated for exposure to the nerve agent after attending to the Skirpals. Her spokesman said the two of them had a "private conversation". Wiltshire Chief Constable Kier Pritchard said: "I know that both he and his wife really appreciated this time with [Mrs May]." Earlier in the day, police cordoned off streets around Mr Bailey's home in Alderholt - 11 miles from Salisbury - as part of the clean-up operation. Officers from the Metropolitan Police, which is one of 15 forces currently assisting in Wiltshire, were joined by members of the Army, as a hatchback car was taken away in a military vehicle. Speaking to reporters, Mrs May said: "We do hold Russia culpable for this brazen, brazen act and despicable act, which has taken place on the streets of what is such a remarkable city." She met one boutique owner, who told her: "We just need the support to get the city going again. It needs to happen quite quickly. "I'm a small independent, we need all the help we can get." Wiltshire PCC Angus Macpherson said on Thursday that local businesses had been "greatly" affected by recent events but stressed: "Salisbury is open, it is safe". Environment Secretary Michael Gove has chaired a meeting of a cross-governmental recovery group to discuss what can be done to help the people of Salisbury. 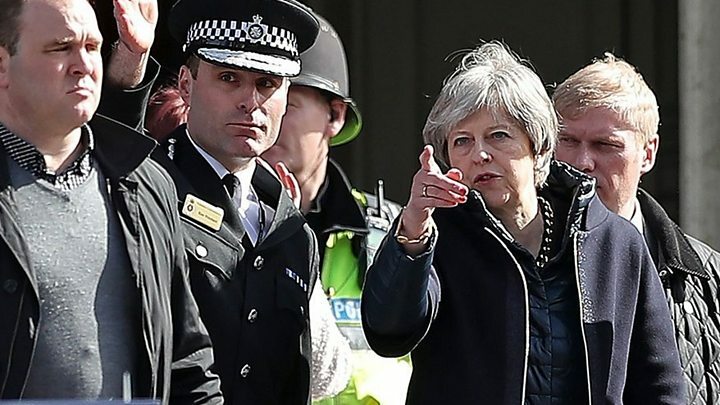 The PM, who also met Public Health England officials, expelled the Russian diplomats on Wednesday after Moscow refused to meet the UK's deadline to explain the use of the nerve agent. She said there was "no alternative conclusion" than to believe Russia was "culpable" for the poisonings. In the joint statement released on Thursday, allies France, Germany, the US and UK said the poisoning was "an assault on UK sovereignty" and "a breach of international law". "It threatens the security of us all," the statement read. "Our concerns are also heightened against the background of a pattern of earlier irresponsible Russian behaviour." 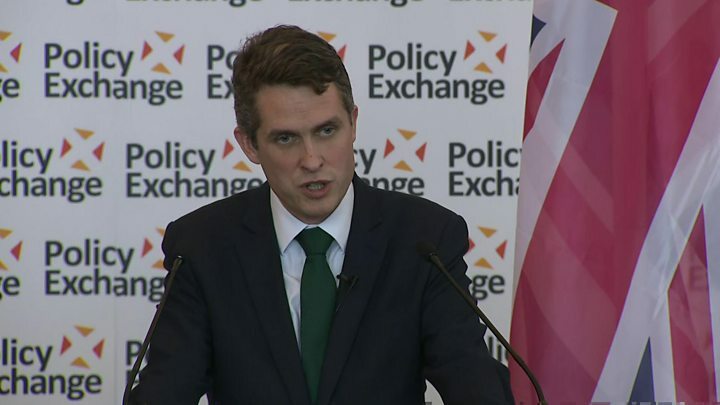 And in his first major speech - unveiling plans for a new chemical weapons "defence centre" in Porton Down - Defence Secretary Gavin Williamson said there was "no doubt the attack came from Russia". Meanwhile, Foreign Secretary Boris Johnson told the BBC the attack was Russia's "way of saying to people this is what happens to people who stand up to our regime". Mr Johnson, who will meet the Nato secretary general in Brussels on Monday, said the UK's allies had been "steadfast in their support" and that he was "heartened" by the response around the world. Mr Skripal is a retired colonel in the Russian military intelligence service. He was jailed by Moscow in 2006 for secretly working for Britain's MI6 but was later released and allowed to come to the UK. Spy poisoning: How is the UK retaliating against Russia? Amesbury poisoning: What are Novichok agents and what do they do?